There are thousands of examples where enterprises plan very enthusiastically to implement agile initiatives only to see them failing after few months. The irony about this is that they are not even aware about the reasons that failed their initiatives. However, the positive thing is that there are more than one ways to address fail patterns. This section focuses on key challenges concerning agile initiatives and solutions to tackle their adverse effects. One of the most common challenges is that organizations shifting to agile from a waterfall methodology fail to discontinue their old habits. The problem lies in breaking the sequential working pattern. It starts with standard sequence of creating business requirements, writing codes, sending them to QA, and then QA sends it to operations being in hurry to certify those codes. Working in this sequence only adversely affects an enterprise’s agile initiatives. For many enterprises, selecting team members with some experience of agile has worked very well. People having only waterfall experience find it quite challenging to thoroughly understand agile methodology. Both the product manager as well as the scrum master should have some level of agile experience. In case of unavailability of either the product manager or the scrum master, an organization can opt for an agile coach temporarily to coordinate with teamsfor the few sprints. Another issue that organizations often face is their important resources being pulled off sprints to manage production issues, and complete other tasks; and in doing so they miss out on deadlines. Now in order to compensate the time loss, the scrum master often decides to allocate less hours to their critical resources. Ultimately, it leads to delay in project completion and missing out on more deadlines. In order to resolve this dilemma, enterprises need to identify unplanned work demanding immediate attention, and unplanned work that they can afford to give attention till the next sprint. The first thing is to examine various challenging situations anddetermine specificsituations that can be termed as an emergency. In case the quantity of unplanned work continues to enhance, then an organization should dedicate a sprint or sprints to determine and resolve the root cause of the particular challenge. If an organization believes that agile is “start coding” and that their architecture evolves as they execute a series of sprints, they might need to be disappointedin the end. At the time of creating something new, they are required to start with a sprint “zero” as it enables an architect to create the user-stories and perform their due diligence. However, when an organization decides to skip sprint zero, they pave roads for unreliable systems and high maintenance costs. Also ultimately, it leads to fragile systems. Unplanned work, in most instances, takes place due to poor architecture. In order to minimize unplanned work, organizations need to begin by performing an architecture sprint (sprint “zero”) first. First a particular project needs to be accepted into the portfolio;then after, the review process of an architecture takes place. After the review process, the architecture team determines the business demands and makes important decisions such as to buy or build, and also determines existing and future non-functional requirements in order to ideally govern the architecture. Many times, organizations face issues in order to keep their sprints intact as priorities change from time to time and also due to their undisciplined working environment. There is no defined discipline to allocate items on the list and that is the reason why their sprints get interrupted very often and also need to be stopped completely. Such activities create countless distractions and prevent them from focusing on important tasks. Organizations doing excellent job at agile know how to break down their important tasks into small manageable chunks. It helps them to stay focused on those tasks. Discipline can make or break things, especially when dealing with agile. It should be the responsibility of the product team to create a roadmap that can provide sales visibility about features that need to be delivered in certain specified timeframe. Also it is the responsibility of sales teamsto ensure that they are following the roadmap created by the product team. Such discipline and coordination paves way to achieve desired agility. 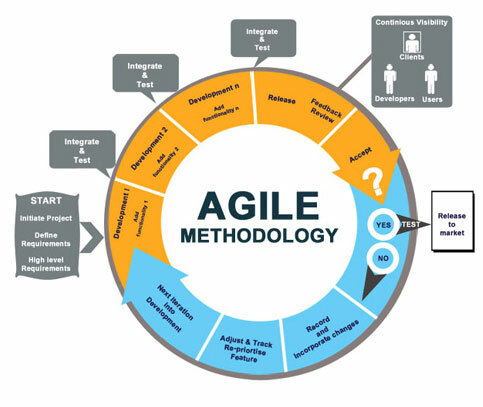 Organizations successfully executing agile initiatives enjoy better productivity, quality, and satisfied customers. In order to prevent agile initiatives from failing, they need to identify common fail patterns and solutions for them before it’s too late.